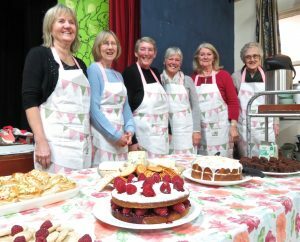 Youlgrave WI invite you to…..
Youlgrave WI has been ‘inspiring women’ in the village since 1919 – so in 2019 we are celebrating our 100th birthday. Several special events are already being prepared to celebrate! We are part of the Derbyshire Federation of Women’s Institutes and the National Federation of Women’s Institutes, and along with our sister WIs around the country we make up the largest voluntary women’s organisation in the UK. We do make jam (well, some of us do) and we do sing Jerusalem; we also support national campaigns on vital issues, learn about anything and everything from belly dancing to fairtrade tea, take trips to places of interest locally and further afield, and we have a lot of fun doing it! We meet on the second Tuesday of the month at 7.30pm, usually at the Village Hall. Each meeting focuses on a speaker or an event of some sort, there is ALWAYS cake, and we are delighted to see new faces – don’t be shy, just come along and you can be sure of a warm welcome! But do be prepared to learn things you never expected to know – in recent months we’ve heard about the life of a vicar in a women’s prison, and how our members’ knitted blankets are sent around the world with an innovative water purifier. We also had some excellent meetings last year learning salsa and Scottish dancing – with much hilarity from dancers and spectators alike! We also have a monthly supper club, usually on the last Thursday of the month and usually involving supper (and wine!) 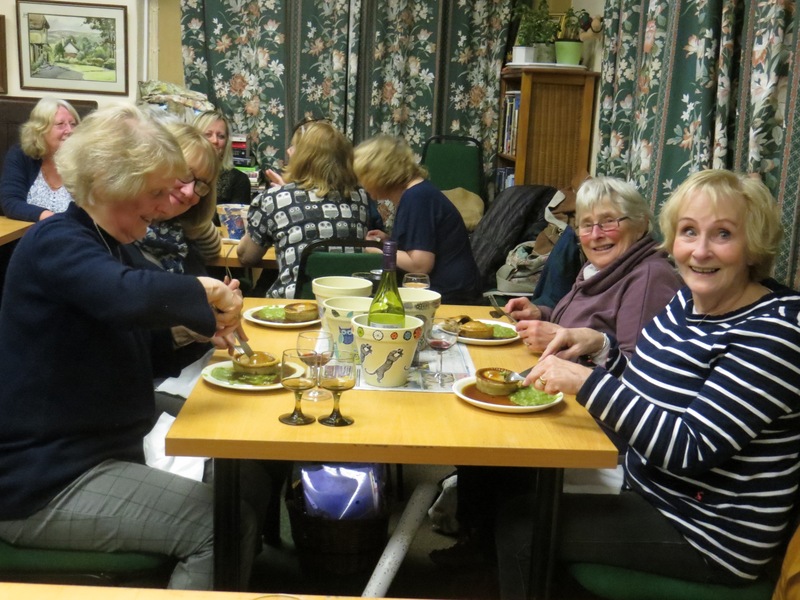 – this gives members the chance to get together and socialise in between the monthly meetings, and is also open to those who are not WI members. 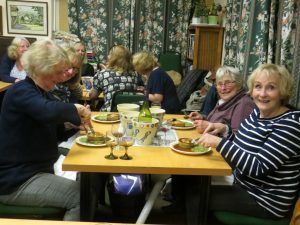 We recently celebrated an excellent Burns Supper and are looking forward to making decoupage flower pots, a Mexican night, a family history speaker, learning about reflexology and a summer walk/BBQ among other excellent plans. Please get in touch for more info! We have regular trips and outings, locally and further afield; recent trips included the BBC Studios at Salford, a lavender farm and a trip to the theatre to see the musical Spamalot. You can find out about these at each meeting, in the Bugle or through our regular email updates. We have a committed book group and a lively craft group, both of which meet regularly in members’ homes and will always welcome new participants. Youlgrave WI Choir was set up in 2016 and has grown from 10 to over 20 members, who are in much demand for various “gigs”. We also have a burgeoning Centenary group who are doing exciting research into the history of Youlgrave from the perspective of the village’s women. Other national campaigns include the SOS for honeybees. 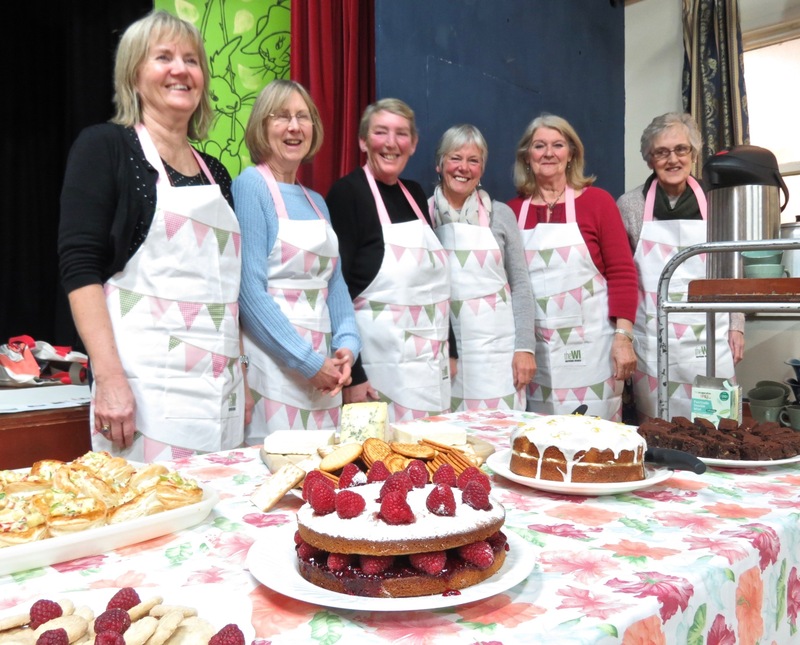 As 2019 marks our 100th birthday – Youlgrave WI came along just four years after the Women’s Institute was first founded in the UK – we have a couple of very special events planned. Watch this space . .
We’re on Twitter @YoulgraveWI and on Facebook – follow or ‘like’ us for all our news and chat. Also see our regular articles in the Bugle for a taste of past and future events . . and photos! Just come along to one of our monthly meetings and tell the people selling raffle tickets at the door that you’ve come to see what’s going on. We’ll introduce you to some new friends and neighbours and make sure you have plenty of people to chat to. And of course make sure you get some supper and a hot drink later in the evening. See you there.